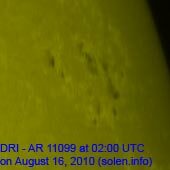 Last major update issued on August 16, 2010 at 04:15 UTC. The geomagnetic field was quiet on August 15. Solar wind speed ranged between 351 and 416 km/s. 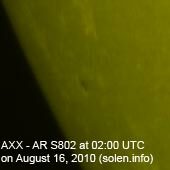 Solar flux measured at 20h UTC on 2.8 GHz was 85.6. The planetary A index was 5 (STAR Ap - based on the mean of three hour interval ap indices: 5.4). Three hour interval K indices: 22011112 (planetary), 22021122 (Boulder). Region 11093 decayed further and is rotating over the northwest limb. 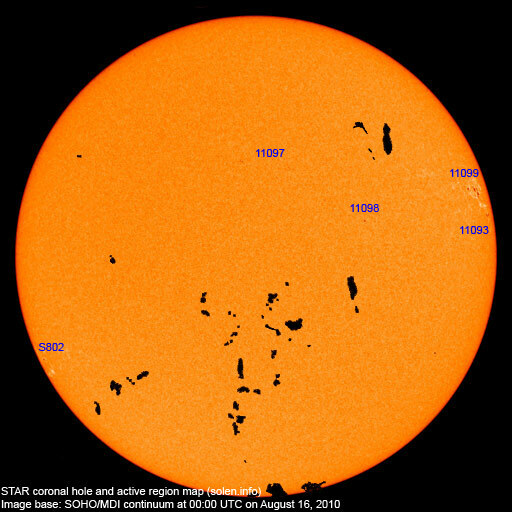 Region 11097 was mostly unchanged and continues to display a few tiny spots. Region 11098 reemerged with a couple of spots. 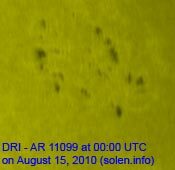 Region 11099 still has many fairly small spots. C flares are possible, as is a minor M class flare. Flare: C5.4 at 18:30 UTC. August 13 and 15: No obviously Earth directed CMEs were seen in LASCO or STEREO images. 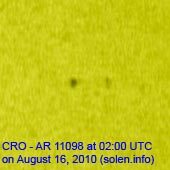 August 14: A fast, partial halo CME was observed after a C4.4 event in region 11099. 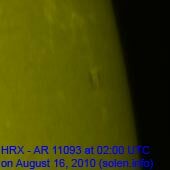 The flank of this CME could influence Earth late on August 16 or on August 17. 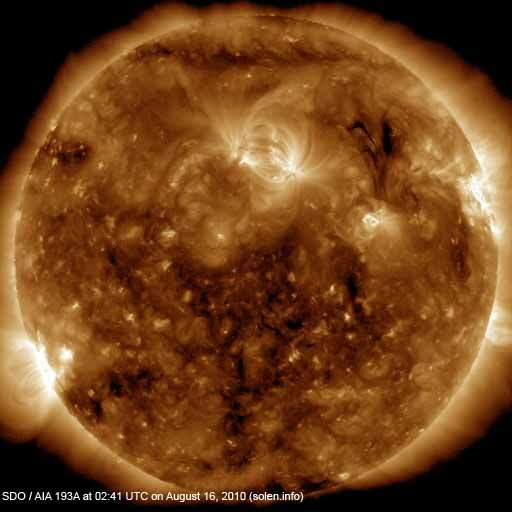 The geomagnetic field is expected to be quiet on August 16. 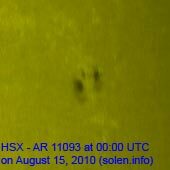 Quiet conditions are likely on August 16 and on August 17 until possible effects from a CME reach Earth. Should that happen a few unsettled and active intervals will be likely.